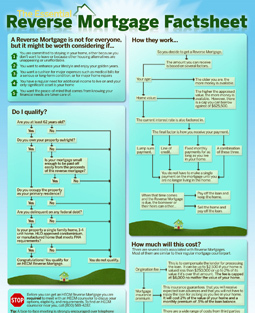 We have recently created a free visual guide for seniors who are looking to understand how reverse mortgages work. 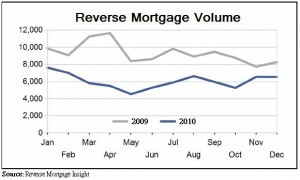 According to a recent data release, the HECM Saver Reverse Mortgages were issued in December 2010. That might not seem like much, until you realize that it implies a gain of 120% in only one month! It seems unlikely that the HECM Saver will revive the ailing reverse mortgage industry, but at the very least, it represents a solid alternative to the HECM Standard. The HECM Saver was introduced in October 2010 to great fanfare. It differs from the HECM Standard only in the absence of an upfront FHA insurance premium, which is offset by smaller loan amounts. The product was designed to be less risky for lenders and to be less expensive for borrowers, and it appears to have filled a solid niche in the the reverse mortgage marketplace. In fact, the Wall Street Journal recently reported that the HECM Saver reverse mortgage compares favorably with Home Equity Line of Credit (HELOC). Even when you factor in the annual insurance premium of 1.25%, the total interest rate is still apparently below current HELOC rates. 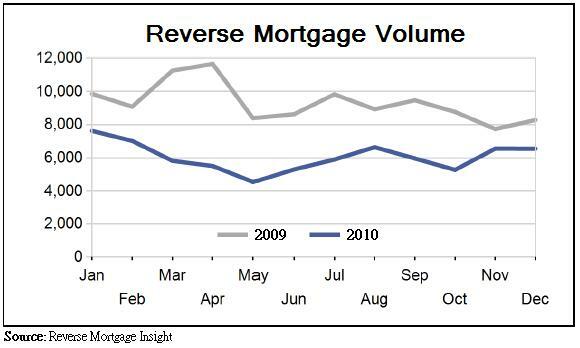 Moreover, the reverse mortgage variable rate and HELOC rate are typically derived from similar rate indexes, which means that this spread should remain constant, regardless of any fluctuations in interest rates. While the WSJ conceded that HECM reverse mortgage closing costs are usually higher than the fees associated with obtaining a HELOC, it offered contradictory examples which downplayed its significance. It featured one borrower that had obtained an HECM Saver in order to avoid temporarily dipping into savings, and who planned to repay the reverse mortgage as soon as his investments recovered. However, it also featured a different borrower that planned to deliberately hold a reverse mortgage for longer period of time, in order to amortize the closing costs over a longer period of time. Without knowing more information, it’s impossible to say whether either borrower made the right choice, financially. Short-term HECM Saver borrowers will end up paying a higher APR when fees are taken into account, while long-term borrowers risk paying compound interest and steadily losing their home equity. For both sets of borrowers, then, the key is looking at a side-by-side APR comparison for the HECM Saver and a HELOC, and decide accordingly. To be fair, there are certain intangible benefits of choosing the reverse mortgage (over a HELOC), namely that you don’t have to make monthly payments and that the lender can’t decide to suddenly revoke the loan if market conditions change. For some borrowers, this might be enough to offset the higher closing costs. This is precisely what the Citizens League, an advocacy group based in Minnesota, proposed in their recent report, “Moving Beyond Medicaid: Long-Term Care for the Elderly as a Life Quality and Fiscal Imperative.” If current trends continue, Minnesota’s Medicaid system will be impossible to sustain in its current form, and the solution may involve reverse mortgages. The report offers some grim statistics about the situation in Minnesota, which can also be seen as a microcosm for a national problem. In sum, “40% of the long-term care expenditures for the elderly in Minnesota in 2004 were financed by Medicaid…Medicaid funding for long-term care for the elderly could grow nearly fivefold in Minnesota, from $1.1 billion in 2010 to $5 billion in 2035.” Assuming that taxpayers balk at financing this entire burden using public funds, an alternative system for financing long-term care (for indigent residents) will nee to be created. While a handful of potential solutions were laid out, I want to focus on the one that involves reverse mortgages. Basically, the Citizens League has suggested eliminating the home-exemption rule, whereby one’s home is not factored into eligibility for medicaid funds. Under the proposal, recipients of medicaid could be prodded to obtain reverse mortgages instead of or in conjunction with medicaid funds. Of course, the reverse mortgage would have to be redesigned in order to provide an additional level of protection for borrowers and to keep costs at an absolute low. Loan amounts would be small (in order to minimize risk and costs), and the proceeds could only be used for medical and long-term care expenses. The benefits to state governments would be fantastic: “It has been estimated that replacing Medicaid’s home exemption with “reverse mortgages” could save Medicaid from $5 to $20 billion a year in the United States. When you consider that states are increasingly strapped for cash and that taxpayers are demanding cuts in public programs, this idea is a practicable way to shift some of the medicaid burden onto those that benefit directly from its services.